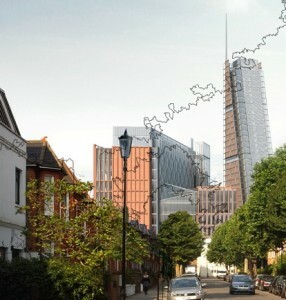 This is what the development will look like, from Oxford Gardens, within the Oxford Gardens/St Quintins Conservation Area in North Kensington, London W10. We have circulated all our members with details on how to help the campaign to halt or change the proposals for Phase 2 of Imperial West. The deadline for comments on the planning application has been put back to March 8th. We will be holding an open meeting at 8pm on Monday February 20th at St Helens Church Hall, W10 to discuss the next stages of our campaign. This plan of the area, from the Environmental Statement submitted by Imperial, shows the potential overshadowing of houses in Oxford Gardens and Highlever Road. Late afternoon and evening sunlight will be lost for much of the year. 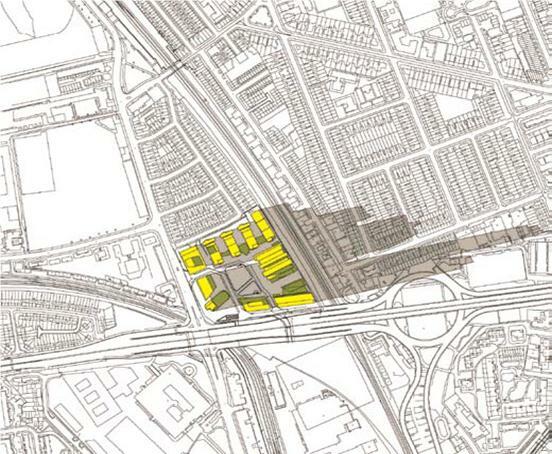 There are no existing tall towers to the west of Wood Lane. No one wants a ‘Gateway to London’ built here. Please also sign our petition at http://www.ipetitions.com/petition/overdevelopment-at-white-city/ This calls on the Mayor for London and the Leader of Hammersmith & Fulham to call a halt to over-development of the White City area. We need you help in supporting this campaign. A series of massive developments, encouraged by Hammersmith and Fulham Council, threatens future quality of life in North Kensington and will destroy for ever the views to the west in this part of London. waiting on some amendments to be made to the planning application form before public consultation can begin. The application reference is 2011/04016/COMB. The application is a combined outline and detailed application, i.e. one that provides details of certain of the buildings for which full planning permission is sought and outline proposals for the remainder. Kensington & Chelsea council will be responsible for local consultation with residents on this side of the borough boundary. Letters should be sent out, and site notices posted, in the next week or so. The consultation period will be a minimum of 21 days from when letters are sent out, and Hammersmith and Fulham say they will also consider letters after this date. The application is not expected to be decided for a minimum of 16 weeks, taking the decision date to mid April at the earliest. The College’s consultants have met the Association’s request for details of the floorspace figures for the total development, including the split between College and commercial use. These figures are set out below, under each of the different building uses. We will be assessing these in more depth once plans and drawings of thre various buildings are available.